Are you ashamed to have a BlackBerry? It's not exactly a status symbol any more, at least not in the U.S., after it got left in the dust by the iPhone. 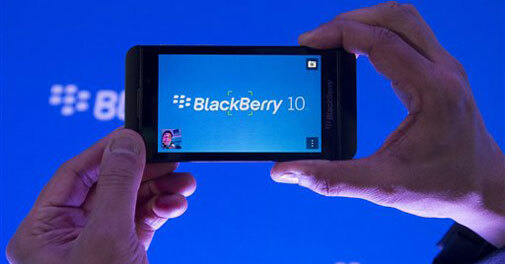 Now, there's a new BlackBerry that wants to get back into the cool club: the Z10 . It's the first phone to run the new BlackBerry 10 operating system, and it is, at first blush, a very good stab at regaining at least some of the cachet of the BlackBerry. The problem is that no one has ever succeeded in turning around a failing smartphone maker. Remember the Palm, anyone? It's simply a brutal industry. So even if the Z10 does everything it set out to do, it might not be enough to save Research In Motion Ltd., the home of the BlackBerry. The company is changing its name to BlackBerry, but that could just be the prelude to riding the brand into the sunset once and for all. It doesn't exactly help that the Z10 looks like every other smartphone on the shelf. It's a flat black slab with a touch screen, nearly indistinguishable at 15 feet from the iPhone 5 or a bevy of Android smartphones. The screen measures 4.2 inches diagonally, a bit bigger than the iPhone but smaller than most Android phones. It will go on sale in the U.S. in March, probably for about $200 with a two-year service contract, in line with the iPhone and other rivals.